【Ingredients】 This product is the main ingredient: matrine. Accessories: sodium metabisulfite. 【Properties】 This product is colorless and clear liquid. 【Indications】For active chronic persistent hepatitis. 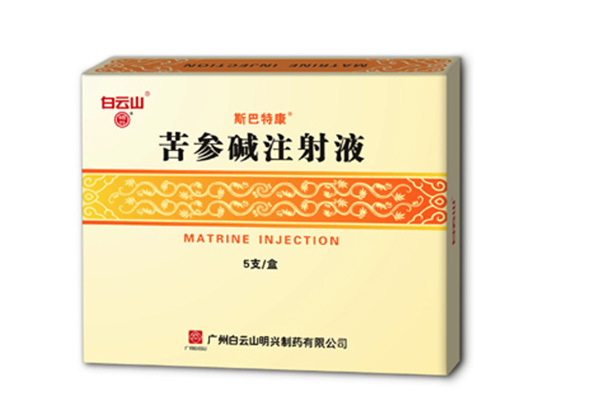 【Dosage】Intravenous infusion: Each 150mg (15ml) (3 each), add 10% glucose injection 500ml instillation, once a day, two months for a course of treatment. Instillation speed of about 60 drops per minute is appropriate. 【Adverse reactions】Occasionally mild nausea, bloating, headache, dizziness and other adverse reactions. 【Precautions】 This product occasionally nausea, bloating, headache and dizziness, disappear after a few days, if there is still response should be discontinued, usually disappear. [Storage] dark, confined, in the shade (not more than 20 ℃) preservation. 【Packing】 colorless ampoule. Each 5ml, 5 per box.